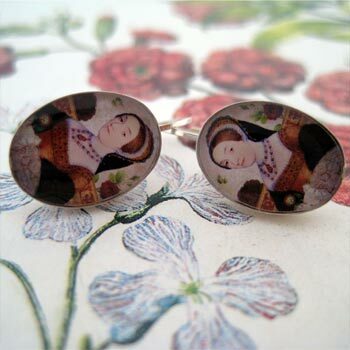 This beautiful, unique and collectible sterling silver earrings feature an image from a collage by Tiffini Elektra of Catherine Howard holding The Tudor Rose with pieces of an antique botanical of red and white roses and ornamental papers and bookplates. One of the symbolic meanings of red roses is "passionate love" and white roses mean "purity". It is said that King Henry VIII called Catherine, "A rose without a thorn". The Tudor Rose is a combination of the red rose of The House of Lancaster and the white rose of the House of York. Catherine is also know as Katherine or Kathryn. 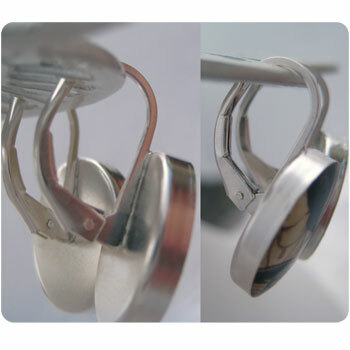 Pair of Sterling Silver oval lever back earrings comes packaged in a lovely gift box. Printed with archival inks and materials the image is protected by a clear, durable and archival resin. 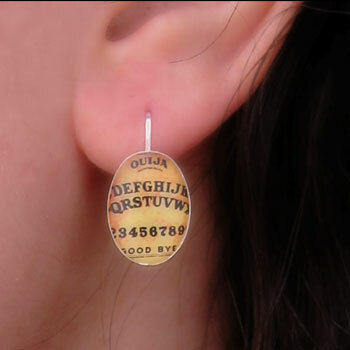 Dimensions: Earrings are approx. 3/4" from top to bottom, Image size is approx. 14mm x 10mm. See "More Details" for further images.